1 of 5 In a medium-size bowl, stir preserves, teriyaki sauce, mustard and ginger. Set aside. 2 of 5 Heat oil in a large nonstick skillet over medium-high heat. Season pork chops with salt and pepper and cook for 2 minutes per side or until lightly browned. 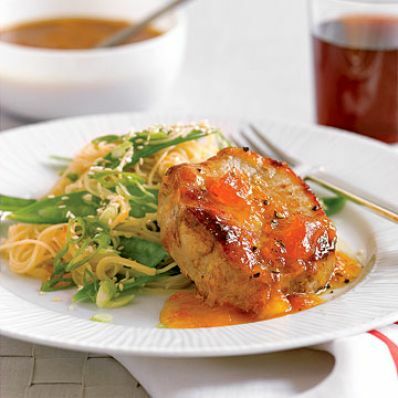 Spread 1 tablespoon of the apricot preserve mixture over each chop and cook, covered, over medium-low heat for 6 minutes or until an instant-read thermometer registers 160 degrees F when inserted into thickest part of meat. 3 of 5 Meanwhile, bring a large pot of lightly salted water to a boil. Add snow peas and cook for 3 minutes. Add pasta and cook for an additional 2 minutes or until just tender. 4 of 5 Drain pasta and snow peas and place in a large bowl. Set aside 1/4 cup of the apricot preserve mixture. Toss remaining mixture with the pasta. Garnish with scallions and sesame seeds. 5 of 5 Serve pasta with pork chops, spooning reserved apricot sauce on top.